Anyway, I got in a discussion about cars and MPGs with a few family members and, amid talk of dismal hybrids and costly conversions, I suddenly remembered a bright spot in the world of automotive technology: Tesla Motors. 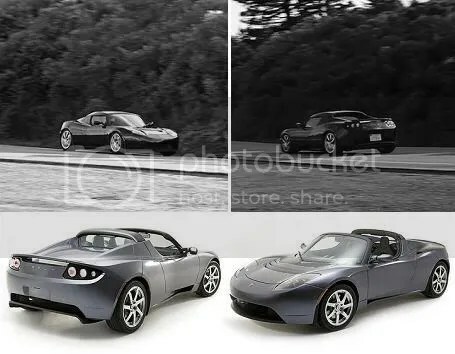 Or rather, I remembered rumors of their exciting (but expensive) Roadster that had raised eyebrows a few months ago. To refresh our memories, the Roadster is a two-seater sports car with acceleration to 60 mph in 3.9 seconds with a top speed of 125 mph (electronically limited) and maximum 248 horsepower at 6,000 to 8,000 rpm (it redlines at 14,000 rpm). It has a range of over 200 miles on a single charge and can re-charge in three and a half hours with the high power connector (also from Tesla). It’s just over nine and a half feet long and six feet wide, has independent front and rear suspension, a clean and uncluttered interior, all the amenities one expects in a car (air-conditioning, power windows and doors, spiffy stereo system, cruise control, etc. ), and – most importantly for a sports car – is a convertible. For an electric car, it’s pretty impressive. But when I visited Tesla’s homepage to check the specs I discovered a more interesting feature: three new models. Okay, one’s not exactly “new” since deliveries are already being made but it was new to me. So, first up, the Roadster Sport, a beefier (288 horsepower), faster (0 to 60 mph in 3.7 seconds) and more performance-minded car with, unfortunately, a price tag to match ($121,000). 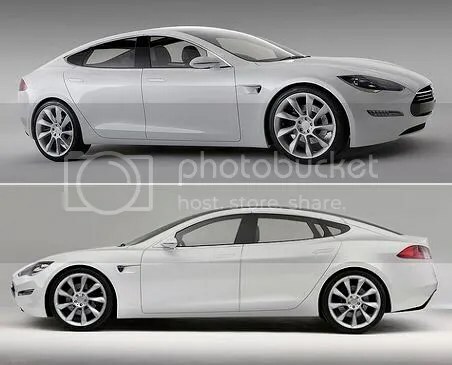 The other two are sedans, the Model S and Model S Signature (which is presumably a slightly beefier version of the former, as with the Roadster and Roadster Sport), scheduled for delivery next year. So let’s run the new specs. The Model S can go 160 miles on a charge or, if you want to upgrade, 230 miles … or if you want to upgrade more, 300 miles. It can charge to 80% capacity in 45 minutes, accomodate 5 adults and two children, and goes from 0 to 60 mph in 5.6 seconds with a maximum speed of 120 mph (also electronically limited). It has a small rear hatchback for storage, as well as a full trunk under the hood (Volkswagen, eat your heart out). The rear seats fold flat to increase storage area if needed and it can purportedly haul a 50″ flatscreen TV or a full set of drums. The base model comes with all the usual amenities (like the Roadster) as well as a 17″ touchscreen with in-car 3G connectivity. I’m no techie but that sounds pretty cool. It costs about $4 to fully charge the battery pack, which has an estimated life span of five to seven years (although it noted ten years was not uncommon with proper maintanence). Best of all, it starts under $50,000. Although all of Tesla’s products are out of reach for many Americans at this point, I think the progress they’ve made is huge. And if these are any indication, the electric car may not be just an idealistic dream for much longer. To find out more, visit the Tesla Motors homepage. All photos courtesy of Tesla Motors.